Ship Direct Domestic & Worldwide. 15% Discount Details on Multiple Books Purchase at yachtsurvey.com. Are They Fiberglass Boats Anymore? "Mid Size Power Boats" focuses exclusively on cruiser class power boats: Expresses, trawlers, motor yachts, multi purpose types, sport fishermen and sedan cruisers. "Buyers' Guide to Outboard Boats" is totally dedicated to blue water type outboard boats; boats that are sea worthy for heading out into open water, offshore. "Surveying Fiberglass Power Boats"(2E) provides a foundation of essentials for anyone who wants to begin a marine surveying career, or just hone up on one's skills and knowledge. "Marine Investigations" is the first and only book of its kind on the subject of investigating pleasure craft casualties and other issues. 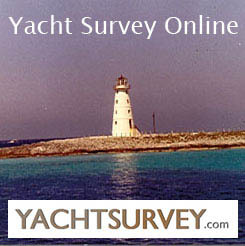 Surveyors: Expand your marine business! Conducting marine investigations can help free you from the limitations of a seasonal business and expand your business opportunities and income. Last updated December 23, 2018.